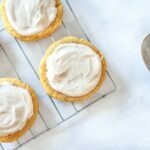 A perfectly soft pumpkin sugar cookie with cinnamon cheese cream frosting makes these a new fall favorite! This time, The Seasonal Simplicity Series is all about Fall Recipes. From soups to desserts and even drinks, this group of bloggers has it covered! Once again, a huge thank you goes to Krista of The Happy Housie for organizing. I think most of us can agree that you can’t beat a good ol’ sugar cookie. This fall, I’m taking my basic sugar cookie recipe and dialing it up a notch with some pumpkin and my favorite fall spices – cinnamon, nutmeg and cloves. And if that doesn’t sound yummy enough, I’ve topped these cookies off with a cinnamon cream cheese frosting. Just because! Funnily enough, the secret ingredient in these cookies is not the pumpkin puree that gives them their signature color and flavor, but the addition of some cream cheese into the dough. It creates the perfect soft yet chewy texture that is going to make you fall in love with this recipe. You probably have most of these ingredients in your home already. If not, stop by the grocery store and make a batch for some special people in your live. They’re sure to love them! Preheat the oven to 350F degrees. Line a baking sheet with parchment paper. In a large bowl, whisk together the flour, cream of tartar, baking soda, salt, and spices. Set aside. In the bowl of a stand mixer fitted with a paddle attachment, mix the butter and cream cheese together until smooth and creamy. Add the pumpkin, 1 cup granulated sugar, powdered sugar, egg, egg yolk, and vanilla and mix until fully incorporated. Slowly stir flour mixture into wet ingredients until dough comes together. Roll dough into balls about the size of a golfball and place on the baking sheet. Repeat process with more dough until you have 10 or so balls spaced at least 2 inches apart. Place the remaining 2 tablespoons of sugar into a small bowl. Coat the bottom of a glass with cooking spray, dip in the sugar, and flatten each dough ball to about 1/2-inch thickness. Spray more cooking spray on the bottom of the glass between batches, if needed. Bake cookies for 7-9 minutes or until tops look mostly dry around the edges, yet still glossy right the center. You do not want any browning. Remove from the oven and allow to cool on the baking sheet for 4-5 minutes before transferring to a wire rack to cool completely. Beat the cream cheese and butter in a mixing bowl until smooth. Add the powdered sugar, ground cinnamon, and vanilla extract; beat until smooth and fluffy. Refrigerate leftovers. Using a knife, swirl the frosting onto the cooled cookies until the tops are covered. Refrigerate in a single layer in an airtight container. Alternatively, store cookies at room temperature and only frost before serving. These look delicious. I am sure the kids will love these. Thanks Jenna for sharing and joining in the blog hop. These sound so good for all us pumpkin lovers, can’t wait to try these! Sugar cookies are my favourite! I love the addition of pumpkin for fall! I have some pumpkin puree leftover from my cupcakes, so these will be perfect for using it up. They look so delicious!